Sad, but true: dogs can get diabetes just as humans do, and they suffer from the side effects every bit as much as humans do. Diabetes is a chronic disease that requires diligence on your part to give your dog as many healthy, happy years as possible in spite of his malfunctioning pancreas. Known formally as diabetes mellitus, this is a disease that prevents the dog’s body from properly using carbohydrates to fuel his body’s cells. In a normal body, the pancreas secretes insulin to keep the blood level of sugar at an appropriate level. Insulin stops the liver from producing glucose from the carbohydrates we eat. Insulin also is responsible for helping the body to store extra glucose so that it can be used later if the food supply is suddenly cut off. In a diabetic dog (or person) the pancreas becomes unable to produce enough glucose to manage these functions. Alternatively, the body may become immune to the effects of insulin, rendering it useless no matter how much the pancreas kicks out. In either scenario, the blood level of glucose builds up rapidly. The blood cannot hold on to all of this glucose, so it spills over into the urine, taking with it extra water through a process known as osmosis. What are the symptoms of canine diabetes? There are two primary symptoms: your dog will begin to urinate much more frequently than usual, and he will be exceedingly thirsty because so many of his body fluids are being lost through excessive urination. How do you know if your dog is urinating “excessively”? You’ll know. It is not unheard of for a diabetic dog to urinate as many as 10 or more times in an hour. The number of times the dog urinates is directly tied to how high his sugar level is. Just observe him for a bit, and you’ll know immediately. In many cases, the dog will be unable to hold his urine and will start having accidents in the house, even though he was fully housebroken before. To replace the fluids he is losing, your dog will begin to drink excessively. You’ll notice that you spend most of your day filling water dishes. Secondary symptoms of diabetes include unexplained weight loss as the body breaks down fat and protein to use as an alternative fuel since the glucose in the blood is unable to enter the body’s cells. The liver begins to make ketones out of fatty acids to fuel the body’s cells. Overproduction of ketones can lead to a condition known as ketoacidosis, where the body’s pH level quickly falls. The dog will excrete ketones through his lungs, giving his breath a fruity scent similar to nail polish remover. A dog with ketoacidosis is having a veterinary emergency and should be seen as quickly as possible by a veterinarian to prevent sudden death. Other secondary symptoms include cataracts and frequent infections. Your vet may be hesitant to diagnose diabetes if your dog is very young, as this is primarily a disease of older-aged dogs. However, if you notice that your dog is urinating and drinking uncontrollably for no apparent reason over the course of several days, it is worth asking your vet to test for diabetes. There are other diseases such as bladder infections that cause frequent urination, and these should be ruled out before diagnosing diabetes. Preliminary testing is done by checking for sugar in the urine. If you follow your dog around the back yard for a few minutes, you may be able to move fast enough to place a spoon under him as he urinates. Dump the urine into a paper cup and take it to your vet for analysis. Get used to the technique required for this maneuver, as you will be doing it a lot if your dog does turn out to be diabetic. Even if the urinalysis turns up negative, your dog may still be diabetic. The definitive test is done by drawing a small amount of blood to test the level of glucose circulating in the dog’s bloodstream. A diabetic dog will have an elevated level of blood glucose even before the disease progresses to the point where there is sugar in the urine. 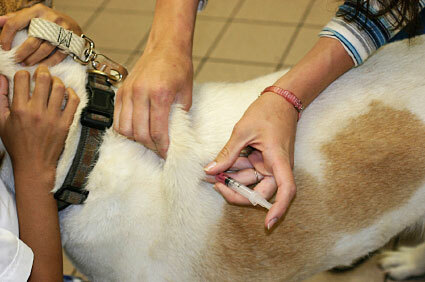 The most common treatment is insulin injections, which are given under the skin of the dog’s neck. Different types of insulin last for different amounts of time, and some experimentation is often needed to find the right combination of quick-release and longer-duration types to control the dog’s blood sugar throughout the day. The easiest way to give the injections is to set the dog’s food in front of him, and while he is eating, simply pick up some of the skin at the back of the neck, slide the needle in, and dispense the medication. In most cases, the dog will be so busy eating, he will not even notice he is getting a shot. Your vet will prescribe a specific type of insulin for your dog, and you will probably purchase it at a regular drugstore. You will also need to purchase needles and testing supplies. The needles are single-use only, and you must carefully dispose of them in a way that prevents addicts from raiding your garbage for them. It is a good idea to hide the needles in a coffee can and surround them with dirty kitty litter, dog doo, or coffee grounds to make them less appealing. Insulin must be stored in the refrigerator and mixed, but not forcefully shaken, before each injection. Always keep an extra vial on hand so that if one breaks while the drug store is closed you won’t have to miss a dose. Keep the vial in the box it came in to protect it from being broken down by light. If the insulin gets too warm or if it becomes frozen, it should be discarded. It should also be thrown out 30 days after the first dose is used, as each puncture of the vial’s lid can introduce bacteria into the bottle. What else do I need to do to help my diabetic dog? It is vital that the dog’s food intake be carefully monitored and kept consistent from day to day. Food given at odd times makes it very difficult to keep the blood sugar at a normal level, as the shots must be carefully timed to coincide with when the blood sugar is expected to peak after eating. Giving your dog cookies can throw the whole system out of whack, as they too will cause his blood sugar to rise. Some people substitute raw carrots for cookies, but even they have quite a bit of sugar in them. Too much food, and the blood sugar skyrockets; too little food and it plummets, which can cause the dog to pass out. A dog with low blood sugar should be considered an emergency. If your dog seems overly sleepy or begins stumbling around or staggering, you may assume his blood sugar is low. Giving your dog a spoonful of honey or Karo syrup can help to bring his blood sugar up in a hurry. It is far better to treat for low blood sugar and be wrong than not to treat when you should have. Regular exercise is also important to maintaining your dog’s health. The amount of exercise should be kept as consistent as possible from day to day in order to have as little impact on blood sugar levels as possible. All of this is well and good as long as your animal is in a “normal” state. However, if he gets a stomach bug and stops eating for a day or two, his medication levels must be adjusted. You should never entirely skip a dose of insulin, but you may have to cut back on the size of the dose to account for changes in diet and activity level. How do I measure my dog’s glucose level at home? Because there are so many variables which can affect your dog’s blood sugar level, your vet may give you a range of doses for the dog’s daily insulin shot. In this case, you will take a urine sample and use a dipstick to estimate the sugar level in the urine before deciding how much insulin to give. If the glucose level is high, you will give a dose at the high end of the range, if it’s low, you will give a dose at the low end of the range. A more expensive, but more precise option is to purchase a blood glucose meter. You will draw a small amount of blood from your pet, dip a test strip in the blood, and insert the test strip into a meter to get an exact reading of your dog’s blood glucose level. Unless you are having a hard time controlling your dog’s levels with urine testing, buying a blood testing meter is an unnecessary expense. What are the dangers of having high blood sugar? Left untreated, or even treated but poorly controlled, diabetes can cause cataracts, blindness, kidney problems, liver malfunction, and yes, it can even be fatal. It is vital that you provide daily insulin shots and control your dog’s food and exercise levels to allow him to live in comfort. When properly controlled, diabetes does not have to shorten your dog’s lifespan. In fact, many dogs have lived full, wonderful lives in spite of having a chronic illness. I recently lost my pet to this disease I managed for 7 years i lost to him to kidney cancer, please do not test your pets urine and decide how much insulin to give the dip sticks are not accurate and it could be dangerous if you purchase the glucometer it in the end could save your pets life and you alot of money!